Enrolled my 9 year old daughter in July 2016 for Muay Thai Kickboxing. I can't say enough positive things about this class, the students, teachers and Guru Ed. Guru Ed has a system that breaks down the punch and kick combinations into small sub-sets that are built upon for larger combinations. The vibe in the class is very positive. Everyone is nice and respectful to each other and upon entry of any new student, the existing students line up to introduce themselves. My daughter absolutely loves it! At the end of each class is circle time for a discussion that centers around respect for each other and for oneself. Guru Ed is not only teaching self defense, but life lessons that can be utilized in the future and accompany them as they continue on through life. As a parent, I am more than satisfied and it makes me happy that my daughter is so at home and happy here at SEAMAA. Keep up the great work Guru Ed! We cannot say enough about this program! 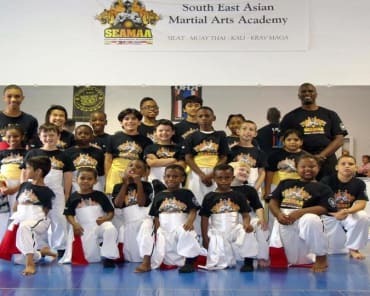 We were looking for a martial arts program for our son, who is on the autism spectrum. We did a free trial and were so pleased with everything we saw! We also signed up his younger sister. The skills and drills are just part of it. We also appreciate the life lessons and values this program emphasizes - things they can carry with them their entire lives and apply at school and elsewhere. The younger coaches are amazing role models. We highly recommend giving SEAMMA a try! 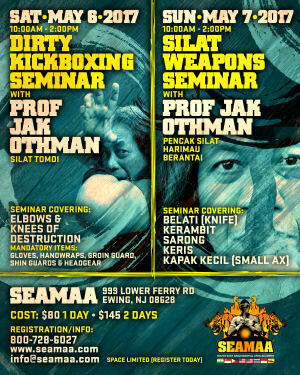 I receive Silat instruction from Guru Ed. He is very detailed and knowledgable, and he tailors an individual's training to their skill level. The class is fun and safe, and everybody I have met there has been super nice as well. Highly recommend!